But only a very little bit. Mom's All Spun Up Falklands. This little hank (~50 yds) was left over from my failed attempt to get the whole 4 oz on to one bobbin while I was plying. It's nice and squooshy and fluffy. 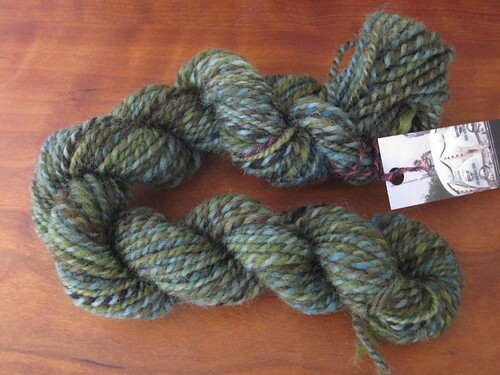 I love how the browns and greens and bit of blue in the fiber blended together in the finished yarn. Now must find some itty bitty project for this. Last week, I was feeling spin-deprived, so I pulled out this and whipped it up in a couple of nights. 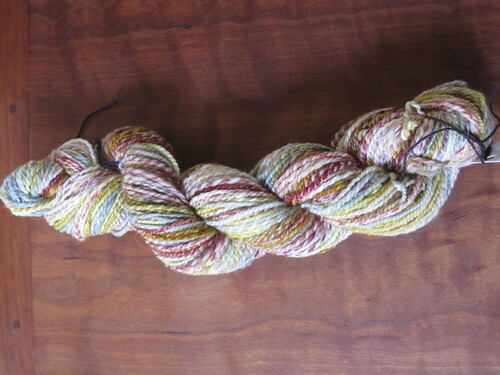 Hello Yarn Fiber Club, superwash merino in "Curiosities". It's been a long time since I spun anything but friggin' Falklands wool, so it took me a little while to get used to the slipperiness of the superwash. It was so slippery! I also noticed this time around that it felt a bit plasticky while I was spinning it - none of that remained in the finished yarn, but it was just an observation. 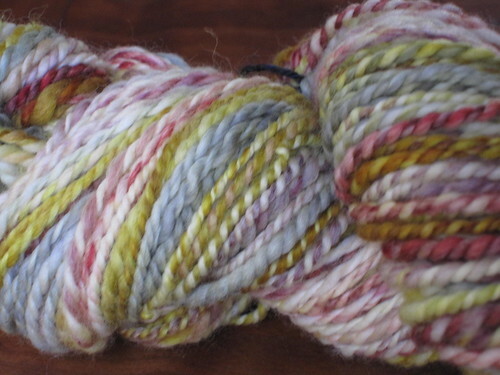 Spun/plied at 9:1/6.5:1. Finished with a soak in warm water and wool wash, then thwacked and hung to dry. Written by porpoise On March 4, 2011 In "fiber club", "spinning"